Adela Yawitz grew up in Tel Aviv and studied art history at Columbia University. She currently lives in Berlin, where she works in the artistic office of KW Institute. At Assaf Gruber’s opening at Galerie Janssen, on a frozen February night in Berlin, Hummus was served with pickles and pita. The crowd included a dog, some wild 4-year-olds, and a professional weight-lifter. The works stood out through all the commotion thanks to their own energy: most pieces in Gruber’s show hold within them a tension, a balance threatening to be broken or tilted. 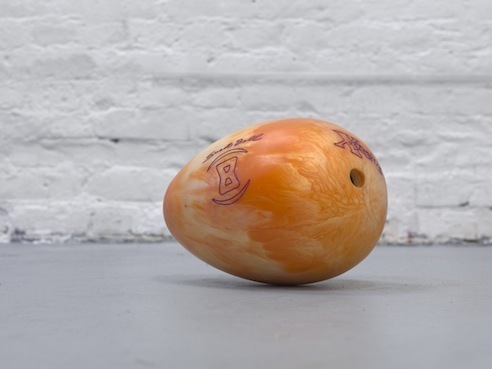 When a child rolled one of the egg-shaped bowling balls, or a woman bumped into a tilted podium, it was clear: none of the works are secured to the wall or the floor, they are sculptures suspended in a balanced moment, and like any single moment, they can be held on to, prolonged, or shattered in a blink. I returned again to see the exhibition on a quieter day. 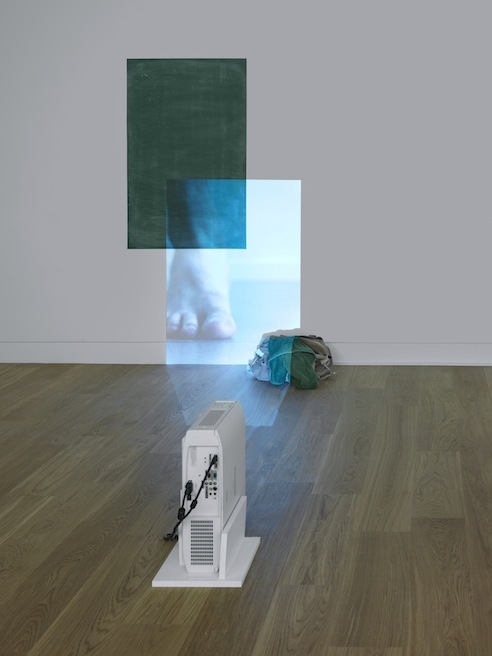 The piece that the exhibition is named after, “Every Corner of the Soul” (2013), shows a wobbling, hopping foot as it tries to keep its balance, against a blackboard-green rectangle and a training bag. The piece’s accompanying sound element echoes through the gallery repeating a snippet from a lecture about lost memories, precious moments, and the depth of the soul – but trails off before giving any answer to these big questions. Along with the blackboard-green rectangle, it recalls a classroom, and the moment of trying to rememeber the professor’s brilliant point from your scribbled notes and doodles. The piece acts as a key to the show by defining Gruber’s work as a practice: a balance, a rehearsal, a trial, which suspends big ideas on purposely flimsy bases, and waits to see what happens. He finds careful midways between polishing and finishing his pieces and leaving some elements up to gravity or light. 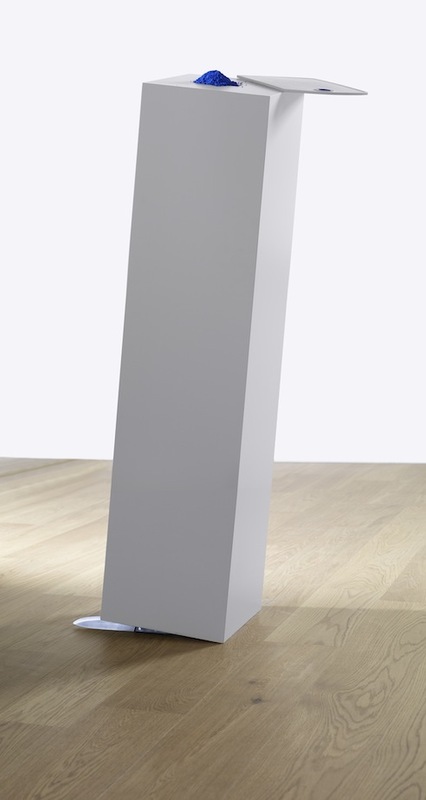 This game shows a formal play with sculpture, and a sensitivity to objects, which I found stronger than the poetic allusions in the press release. Yes, it’s Foucault giving the lecture, and depending on such a reference can weigh down an exhibition. 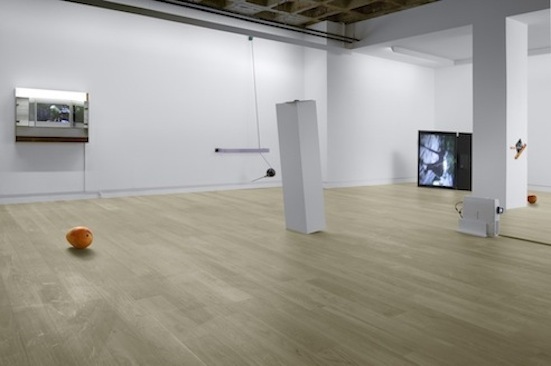 But the show refuses to be heavy: across the room, the artist’s jumping foot is mirrored by a jumping parrot, balanced on one leg and hopping to stay on its perch. A movie star climbs a cliff up and up, hopelessly, since the monitor is lying on its side. 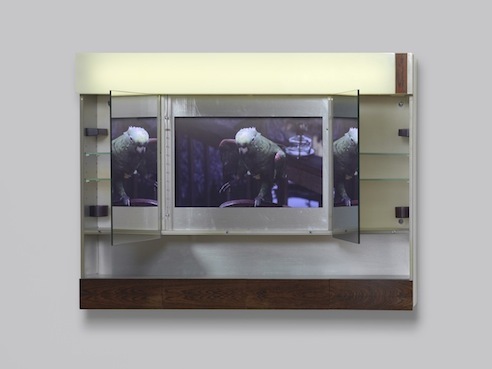 The exhibition manages to extend certain frozen, physical moments; even when they are shown an iPad, they relate to physical presences, and to gravity – evading it, making fun of it, challenging it. Maybe it was the Foucault in the air, but the best pieces, for me, held the energy of a memory, which we perceive as a frozen fact, but which are usually wobbly, insecure, extensions of a past moment. All images are courtesy of Galerie Michael Janssen, Berlin.